Congratulations on purchasing your Soliloquy license! To begin using the premium version of Soliloquy, you’ll need to first enter and verify the license key. This not only allows you to receive automatic updates but also will make installing Soliloquy addons from the WordPress Admin that much easier. 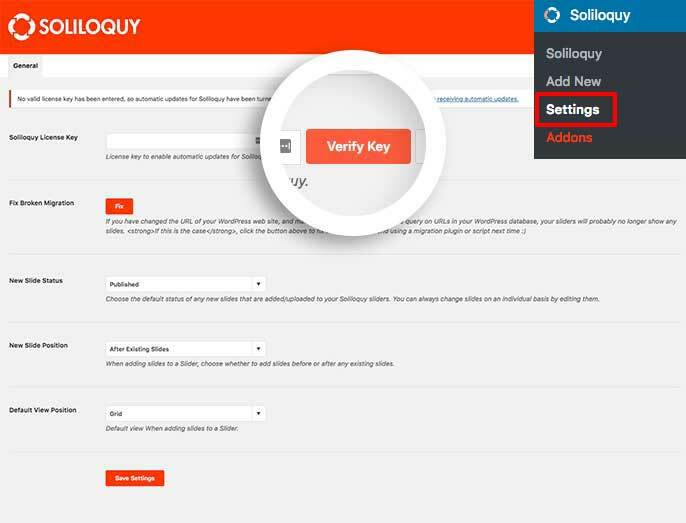 We’ll walk you through each step on how to verify your Soliloquy license key! Can I define the license key in my wp-config.php file? If you were previously using Soliloquy Lite you’ll want to follow our guide for a walk-through of how to upgrade from Soliloquy Lite to a paid license. 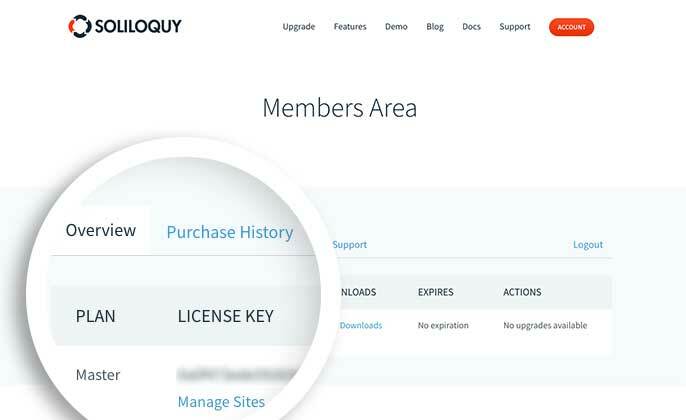 First, log into your Soliloquy account and you’ll find your license key displayed in the Overview tab. 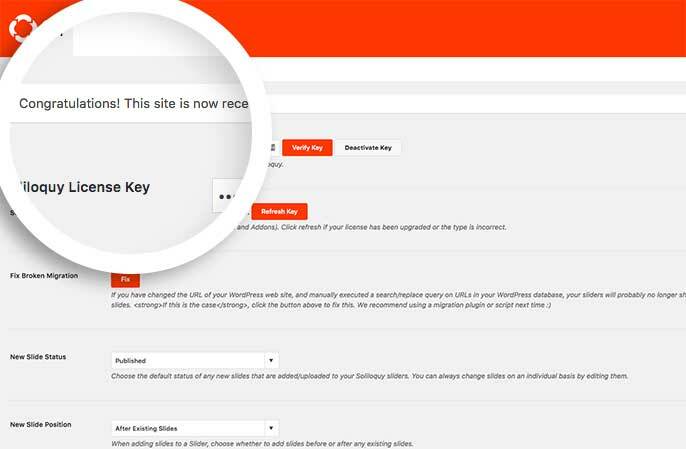 Copy the full license key before returning to the admin of your site. To begin verifying your Soliloquy license key you’ll need to log in to your WordPress site. From the WordPress menu on the left, navigate to Soliloquy » Settings screen. Here you’ll see a field where you can paste your license key. Paste your Soliloquy license key in the Soliloquy License Key field and click Verify Key. Once verified, this screen will show a success message confirming your license key is verified! Now that you’ve verified your license key you’ll want to get started creating your first Soliloquy Slider or installing Addons. Q: Can I define the license key in my wp-config.php file? If the license key field in the WordPress Admin » Soliloquy » Settings screen is left empty, Soliloquy will check for the above wp-config.php code.